Although I now live in the Southwest, I’ve been aware of the situation of these sheep since 1985, when I lived in New England. I first learned of them when I was sitting in a barebones office in West Hartford, Connecticut, as the new and on-the-spot editor of Shuttle Spindle & Dyepot, reading a communication from Lyle McNeal. In the past 23 years, I have had a number of opportunities to explore their history and situation through library and internet research, talking with quite a few people, and some travel. Also, of course, a bit of spinning. The progenitors of the Navajo-Churro arrived in North America with Spanish explorers in the 1500s. These weren’t the fancy Merinos but the sturdier, more common sheep. Between the sixteenth century and the late twentieth, the history of these animals and their connection to the cultures of the Southwest was been marked by significant heights of artistry and sometimes, as in the government-instigated Long Walk of 1865 and stock reduction of the 1930s, tragedy. By the 1970s, almost none of these sheep were left. What a loss that would have been. Navajo-Churros are uniquely adapted in many ways to a harsh climate with little water or vegetation. They are closely entwined with the Hispanic, Pueblo, and Navajo peoples of the area. 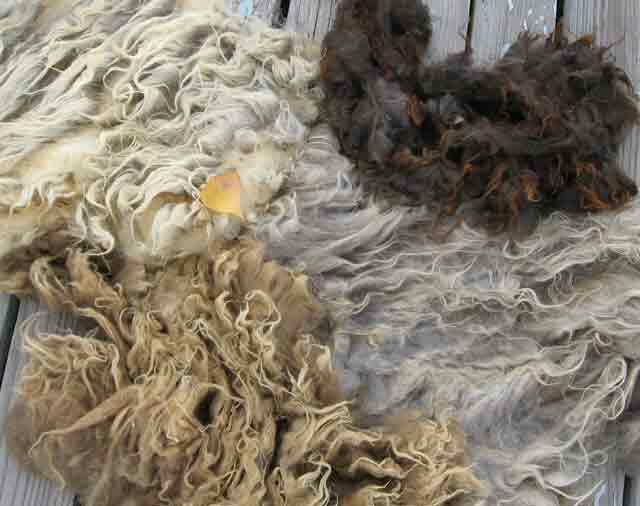 They produce a versatile, durable wool that comes in a wide array of natural colors. Fortunately, a few visionaries working hard for many years have pulled the breed back from the edge of extinction and re-established it in its natural and cultural niches. There are Navajo-Churro flocks now outside the Southwest as well; having some geographic diversity of genetic resources provides a safety net for their long-term survival. There’s lots more to say about Navajo-Churros. For the moment, though, I’d just like to appreciate their fiber . . . although I’ll do so with some details. 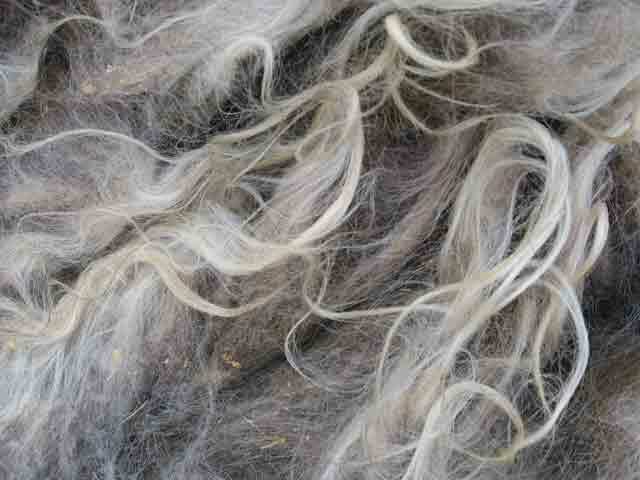 As usual when you have such a spread of colors in a breed of landrace origins (one that is adapted to a particular geographic niche, instead of having been bred for consistency), the individual fleeces have different characteristics, all within a range that becomes familiar over the years as you see wool from a variety of animals. Among all of the Navajo-Churro fleeces I’ve seen, there’s been more or less double-coatedness. The most remarkably single-coated was in the back room of a trading post on the Navajo Nation. It was being reserved for local weavers, but we were allowed to admire it. Some of the Navajo-Churro wool I’ve seen from outside the Southwest has carried much more grease, perhaps from the change in climate or shifts in husbandry practices (especially, I’d guess, feeding). 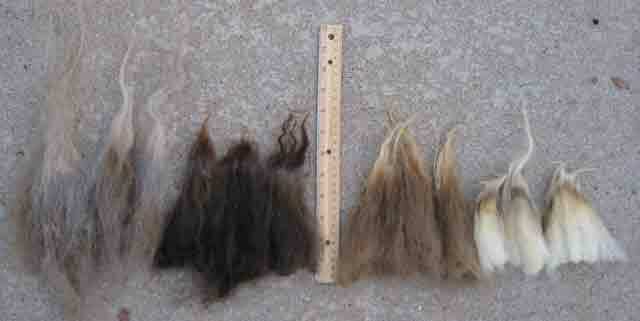 Here are locks from each of those four samples. The gray locks are obviously longest and the white are shortest. Yet all of the locks have similar "personalities," if I can go so far as to use that word. Which, of course, I just did. One of the things I love about wool—especially in some breeds, like Navajo-Churro—is that not only each fleece but each lock is distinctive. Here’s a closer view of one lock from each of the selections above. I think it’s easy to identify which lock I selected from each group. Yes, I’m avoiding the computer. Somewhat. I’m about to go back at it. Okay, now I have to wipe the drool off of my keyboard! Thanks for the diversion while I’m in the midst of unpacking/cramming/cursing in my new much much smaller office space. It’s an area where I would like to improve my knowledge. All I know for sure is that they behave better if you process tham at home. I always like the resulting yarn better. Talking about processing double-coated. . . . I’ll see whether I have time to do it for the blog before the book deadline. Much of what will happen here will be what I see from the hot-air balloon, floating over the landscape of the book. . . .
And Ellen, delighted to have given you something lovely to think about! This wool is certainly delicious. Having lived on the Navajo Reservation and having had a friend in Elfrida, AZ who raised Navajo Churros for a while and who permitted me to write a news aericle about her sheep as well as sold me fleece, I can vouch for your feeling that quality feed makes a great difference in the wool.